This one is on Chris Armas. We understand squad rotation; we understand changing the formation and tactics. We don't understand doing it all at the same time. Metro paid dearly, going down to Columbus 3:0 at the half before making a spirited comeback that eventually fell short. The final score was 3:2. Armas not only rested Kemar Lawrence, Alejandro Romero Gamarra, and Bradley Wright-Phillips, he also switched to the five-man backline with Connor Lade manning the left side and Aurelien Collin joining the center of the defense. Derrick Etienne moved up to lone striker, clearly a position he is ill-suited to play, and Tyler Adams lined up in attacking midfield position. Daniel Royer also returned to the starting lineup. The first two Columbus goals came in the 7th after Metro failed to clear the ball, and then in the 24th after the defense was caught upfield. The back-breaker arrived in the 31st when Sean Davis knocked a corner kick into his own net. It's not that Metro was down three goals; they simply looked inept. The vaunted press was nowhere to be seen. Columbus was easily abusing the oodles of empty space. One team was sharp, with pinpoint passing and streamlined attack. The other team was Metro. But let's give it to Armas, as he has shown that he can make adjustments at halftime that change the game. So ARG and BWP came in at the break, and the game was altered. With little to lose, Metro became the aggressor. 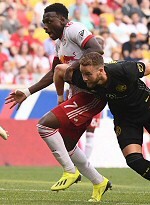 Five minutes after the break, a goalmouth Royer cross was knocked into his own net by Jonathan Mensah (originally it was credited to BWP, who was on the Columbus defender). Then, in the 69th, a perfect Romero Gamarra ball found the head of Royer, and all of the sudden, Metro had life. That life was extinguished, as the mountain proved too steep. Romero Gamarra fed Royer once again, with the Austrian running into the box and having a clean look from the left side, only to shoot wide. A dead center free kick from right outside the box was too high from ARG, and that was it. Hopefully, Armas will learn from his mistakes? Lineup: Robles, Lade, Long, Parker, Collin, Murillo, Adams, Davis, Rzatkowski, Royer, Etienne. Subs: Wright-Phillips, Romero Gamarra, Muyl.